TECH Digest. Subscribe to a weekly curated selection of Silicon Valley tech and diversity news with an African American focus. 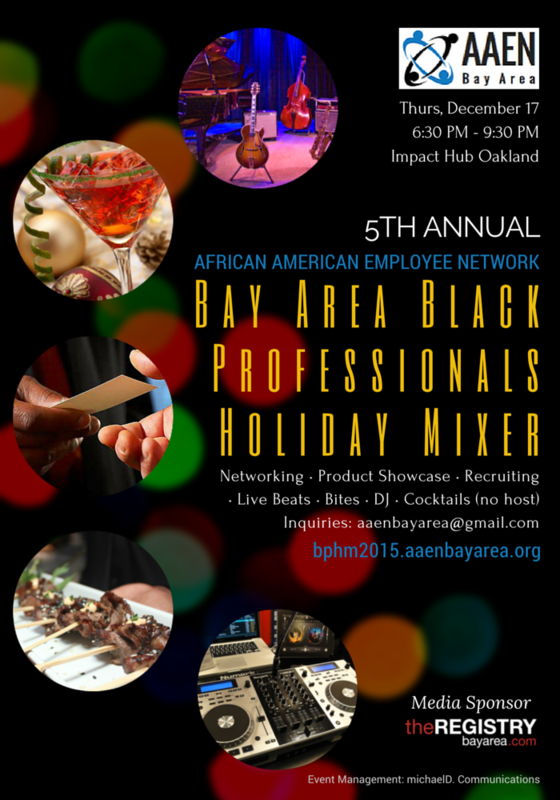 A sellout every year since inception, join the African American Employee Network (AAEN) and theREGISTRYBayArea.com at this popular Bay Area holiday celebration for Black professionals. This annual event brings together AAEN's collaborative network of corporate employee/business resource groups, professional organizations, STEM organizations, investors, small businesses and individuals from the private, public and academic/education sectors. Who's already bought tickets? People from Abbott Laboratories, Albertsons / Safeway, Altera, Apple, Ask.com, AT&T, Auris, AXA, Bank of America, Bank of the West, BART, Bellbridge, Blue Shield of California, Booz Allen Hamilton, Brocade, California Bank & Trust, CDNetworks, Charles Schwab, Chevron, Cisco Systems, CitiBank, Clorox, Comcast, Cooper Vision, DelMonte Foods, Eli Lilly, Expertus, EY, Exxon Mobil, Facebook, Gap Inc., Genentech, Gilead Sciences, Inc, GlaxoSmithKline, Google, Grainger, HPE, IBM, Intel, JPMorgan Chase, Kaiser Permanente, KPMG, LinkedIn, Livefyre, Lyft, McKesson, Merrill Lynch, Microsoft, NASDAQ, Netflix, Netgear, Optimaze, Oracle, PG&E, Pinterest, Pixar, Practice Fusion, Pixar, PwC, Randstad, RocketFuel, Salesforce, Sandia National Laboratories, SAP, Sutter Health, Symantec, T-Mobile Business Solutions, Tesla, Tivo, Twilio, Twitter, Union Bank, Walmart, Wells Fargo, WorkDay, YP Holdings, Xamarin....as well as small to medium sized businesses and professional organizations. Dec 12 | Black Girls CODE Bay Area Chapter Presents - Robot Expo!